Offering style, function and versatility, the 5 piece stainless steel pan set from trusted cookware brand Morphy Richards makes cooking simple. 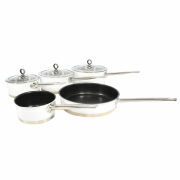 Containing a 16cm, 18cm and 20cm saucepan alongside a 14cm milk pan and 24cm frying pan, the set offers every pan you could need in the kitchen. With high grade stainless steel body and tempered glass lids, the pans are as durable as they are stylish, with a Thermocore Encapsulated Base enabling them to be used on all hob types. A 4mm encapsulated base ensures even heat distribution as well as making the pans suitable for all hob types, including induction.Features:16cm / 18cm/ 20cm saucepans14cm milk pan/ 24cm frying panHigh grade quality stainless steel bodiesHeat resistant exterior coatingSatin finish interior with capacity markingsRobust riveted handles and lid knobTempered glass lids with steam vents4mm encapsulated base for even heat distributionSuitable for all hobs inclunding induction10 year guarantee / Colour box packagingWarranty with RKW: 1 Year.Extended Warranty: 9 Years. Valid only if item is registered within 28 days of receiving it.